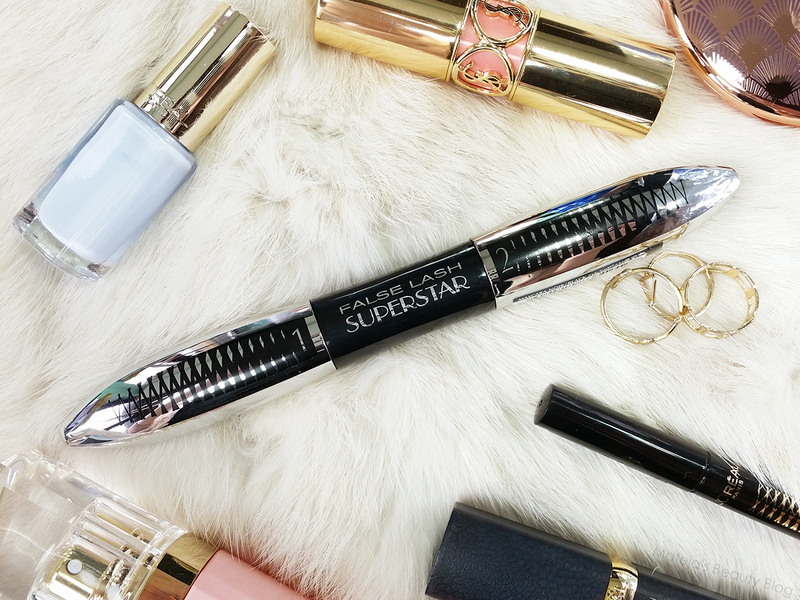 Even I haven't missed the heavy advertisement campaign for the new Superstar mascara and eyeliner, and I always skip commercials when watching tv. Mascara is a two-part one and they've had such mascaras before, but I'm not sure if those had fibres or not. The eyeliner is already more innovative. It features a very interesting spear-like nib that is bendy. I won't beat around the bush - I intensely disliked this mascara from the start. It made my lashes look messy, not clumpy, but just every lash was going into its own direction. 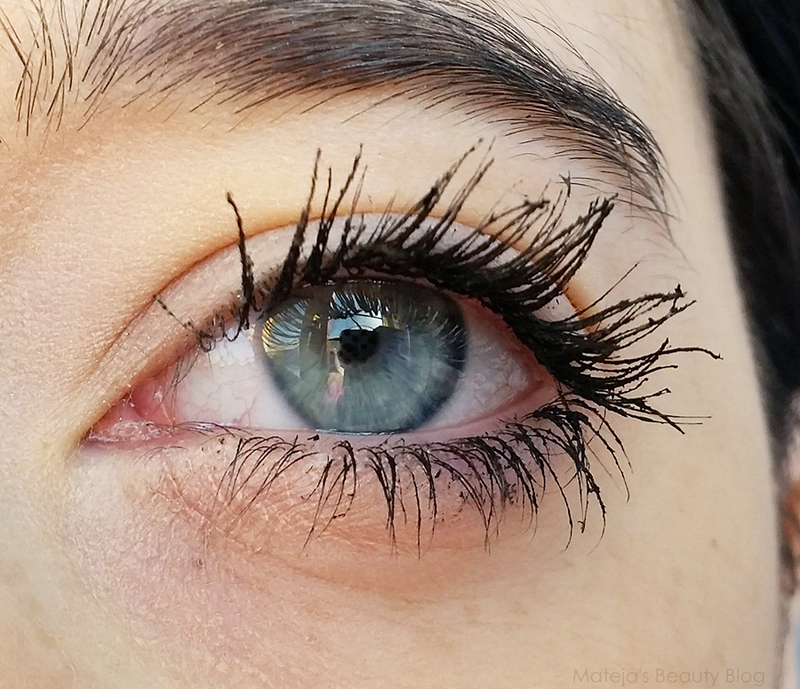 As a great majority of mascaras, it improved over the next weeks and it became a lot easier to deal with. But it's still a regular formula mascara that doesn't hold curl, so it's like it does nothing for me. 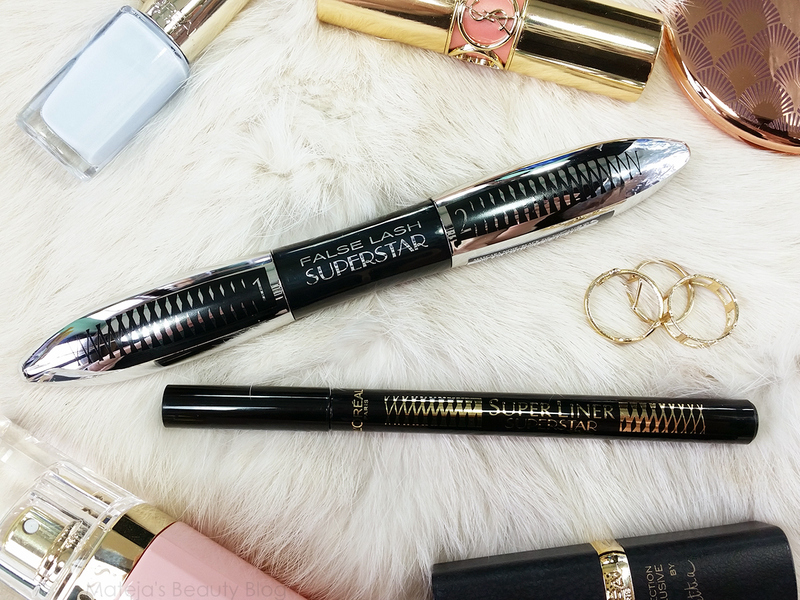 False Lash Superstar Mascara is made out of two parts: the white primer coat and the black mascara. The white primer tints the lashes white at first, but it dries a lot less intense shade. It gives a lot of volume, though it's difficult to see due to it being white. The brush of the primer part has a hourglass shape. The black part feels thinner, but I can see the fibres on the brush, which actually has a different shape than white and it's a curved design. It doesn't feel like there are a ton of fibres inside, like at Asian mascaras, but they have fallen in my eyes a couple of times and it really wasn't pleasant. The black mascara part covers all the white bits on the lashes and makes them super black. 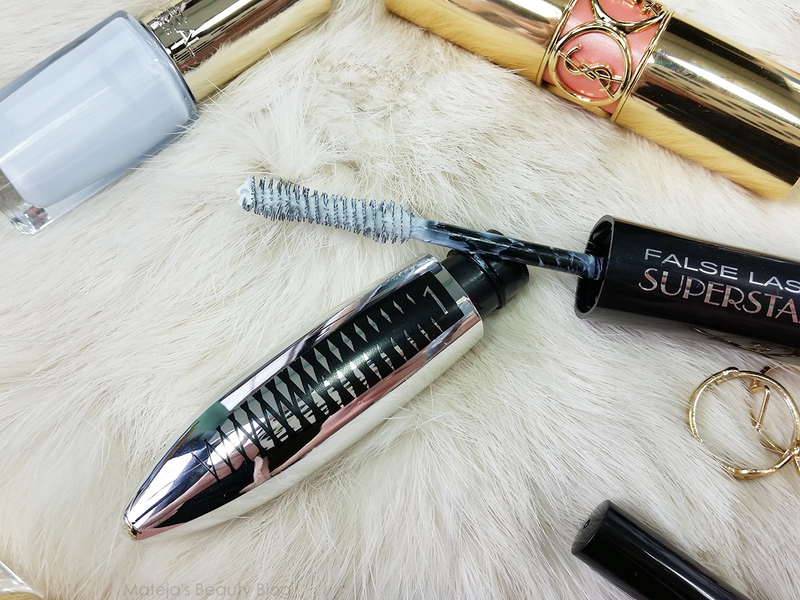 The finally effect is very volumising, truly the volume is very impressive especially when it's been opened for a few weeks, but the lashes aren't defined enough for my taste. Through the day it lasts well, I didn't get any smudging or flaking, but fibres did fall in my eyes, which made them water and then of course mascara did smudge. 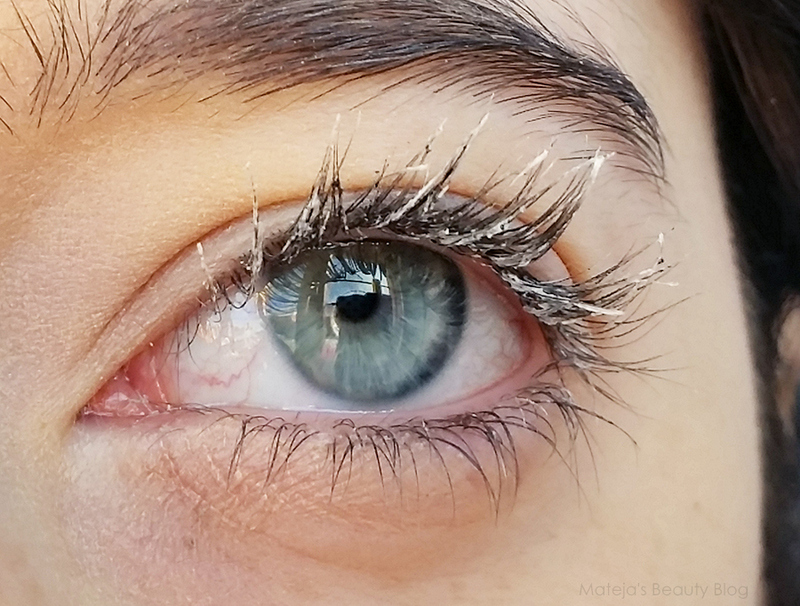 I tried the primer with a very defining regular formula mascara that has a plastic comb and it started to look a bit spidery, so I wasn't happy with the result. 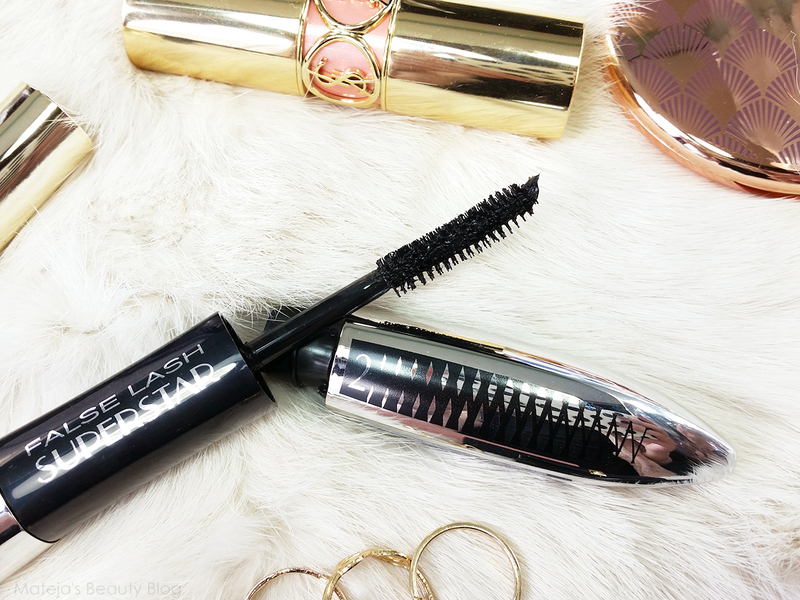 Due to it being a regular formula, my lashes of course drop immediately with it and since it's such a lengthening and volumising mascara, my lashes keep hitting my glasses, occasionally making an actually scratchy noise. Seriously, am I the only one with this problem when I wear regular formulas? 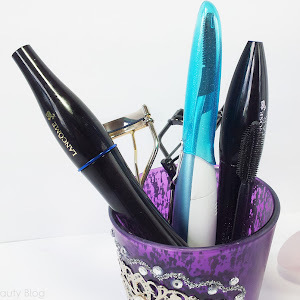 But what I'm very bothered by is that this mascara appears to be almost oily or something, since I need to clean my glasses ever 15 minutes when wearing this. Very annoying. 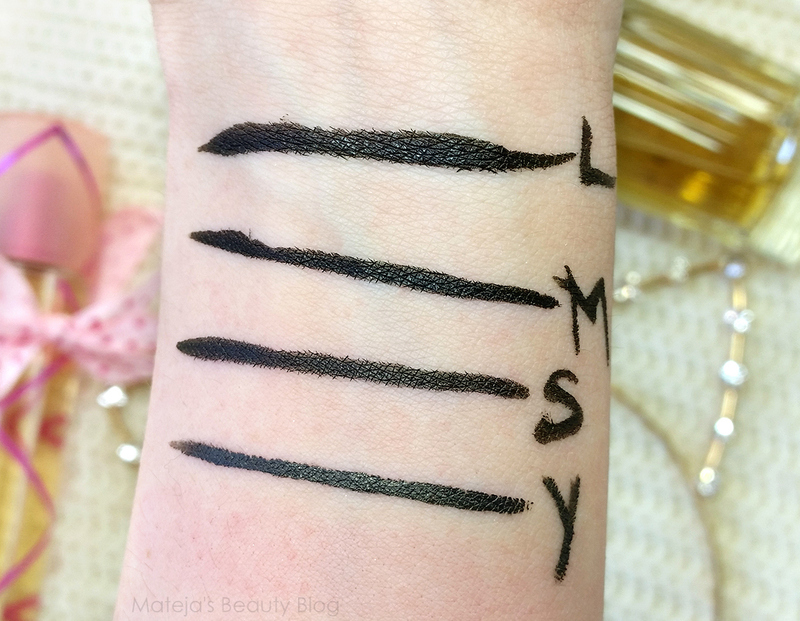 Since I find regular formulas unimpressive, I gave the mascara to other people to test. It did not receive a very enthusiastic response, I'm afraid. Still if you liked the previous versions, you might like this one as well, since I assume it's very similar. This mascara costs 15.65 €. They eyeliner is already more my cup of tea. 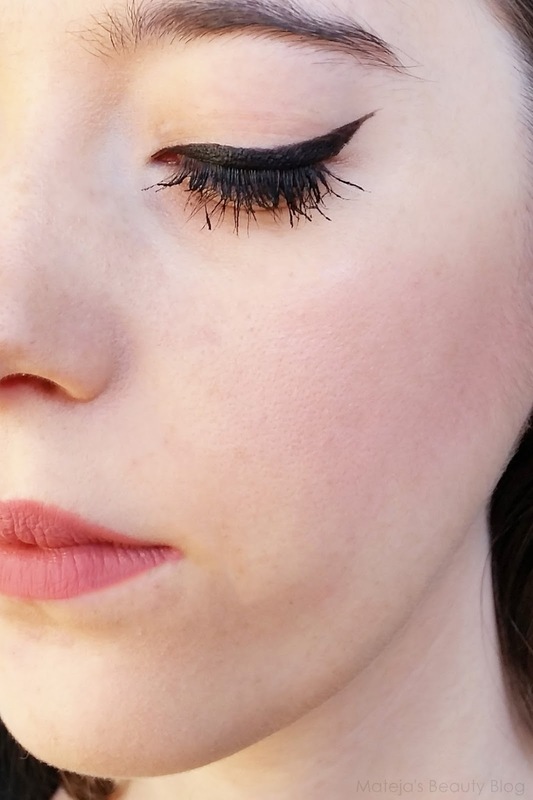 I've tried tons felt tip eyeliners so far, these type of liners are some of my favourite makeup products and I currently have four new ones and two that are on their lasts legs, but this one has definitely the most unique tip I've ever tried. It's shaped like a spade or spear and is one of the largest of the slim eyeliner versions I've seen. The clipped base makes the nib bendy, so it feels more comfortable to use than a regular stiff felt tip applicator. However, the whole applicator is quite big, so it's difficult to get a very thin line. Out of the four new ones I have, I like this shape best for creating flicks, but they aren't completely sharp. Formula is the same as at their Perfect Slim version, which remains one of my favourites. It's black, smooth and lasts nicely on my normal lids, except the flicks disappear by the end of the day. It has a semi-matte finish, which I much prefer to the glossy Stila one. Yanquina Waterproof Eyeliner, Stila Stay All Day Eyeliner, Milani Eye Tech Extreme Liquid Eye Liner and L'Oreal Super Liner Superstar. 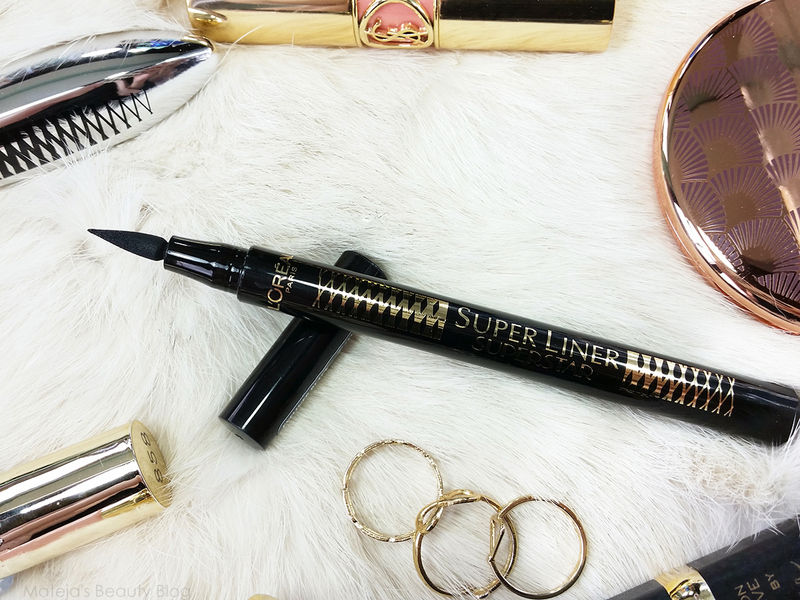 L'Oreal Super Liner Superstar, Milani Eye Tech Extreme Liquid Eye Liner, Stila Stay All Day Eyeliner and Yanquina Waterproof Eyeliner. It's not the cheapest, but also not the most expensive eyeliner, so it's still acceptably priced for me, but it also depends on how long the tip will stay saturated. 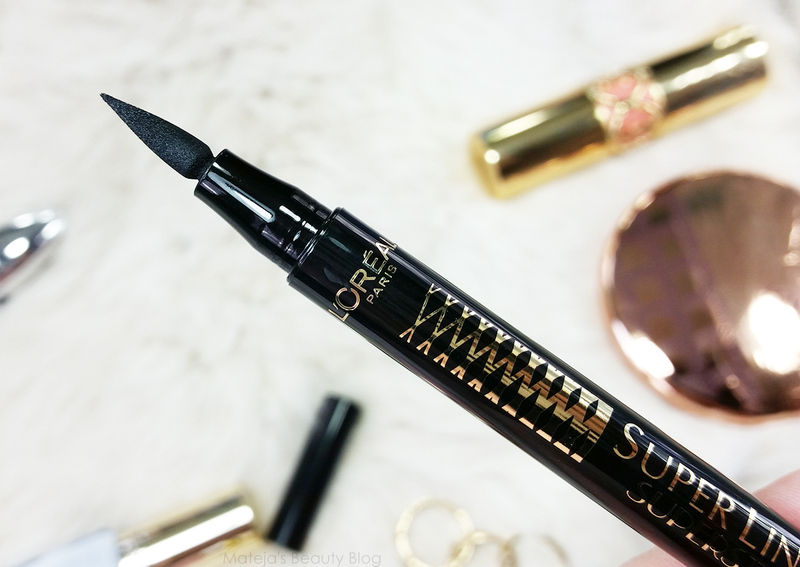 I think that if I needed a new good eyeliner fast, this is the one I'd get in our drugstores. It's reliable, easy to use and available everywhere (we don't have the Perfect Slim one here, but that one would be my first choice if we did because of the smaller nib), so it would be my first choice, while Essence would be for a cheap option and Artdeco for a splurge, since I love the applicator on that one. 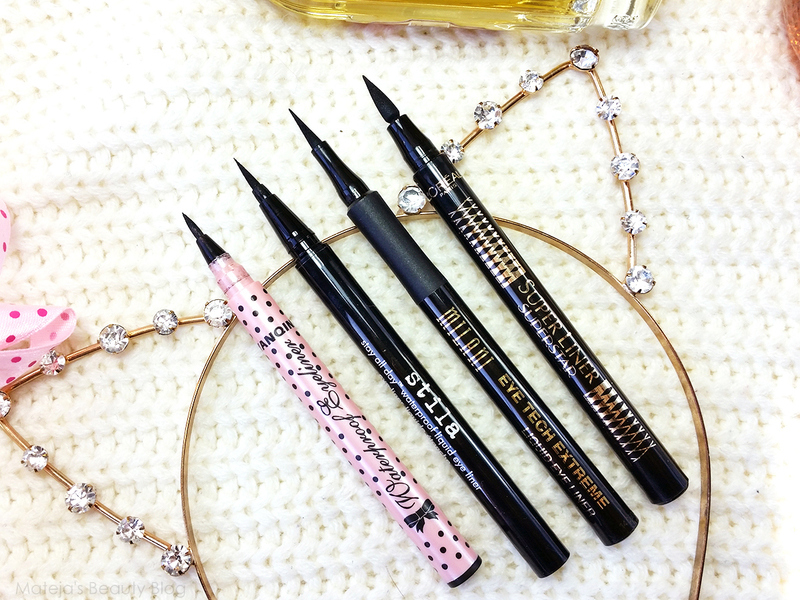 *both products were sent to me, but I would get the eyeliner myself, since I love trying such products. The liner looks nice. I love black liners. 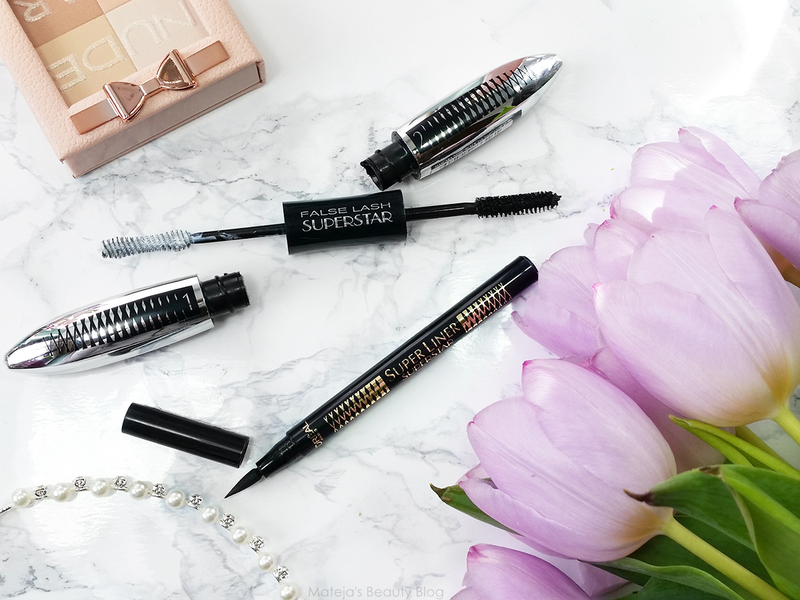 Thank you for this review, it has been very helpful for me since I was going to buy it but it has hold me back the fact that I have very watery eyes and this mascara is not waterproof. If you have watery eyes also stay away from fibre mascaras because when those get in the eyes, it hurts so much. Meni nič s temi vlakni ni kaj preveč všeč :/ Ne, da bi imela občutljive oči, ampak vedno mi kaj pade v oči in res ni prijetno. Enkrat so mi celo čisto nove leče popolnoma uničila ta vlakna. Mateja, only you have this problem with lashes :P Ne poznam nobene, ki bi imela tako dolge trepalnice kot ti :D. Mene te bele maskare ne pritegnejo. Se mi zdi, da vedno izgledajo trepalnice bolj clumpy ker imam jaz tudi rada več definicije. Eyeliner pa mi tudi ni preveč več konica, sploh če ne gre z njo narisat tanke linije. 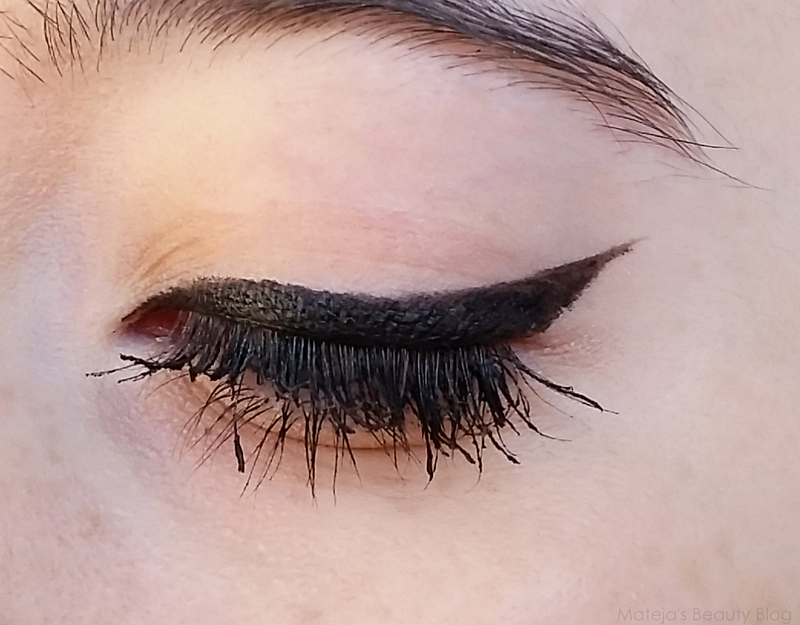 Je pa priročna za ta bold winged look, če je komu to še posebej všeč. Kar dvomim :D Se mi zdi, da vedno vidim punce z večjimi trepalnicami kot jih imam jaz :D Dolgo časa sem imela trepalnice kar razprte na dva dela, ker so mi zadela v stekelca očal, zato sem pravzaprav začela uporabljat klešče za trepalnice pri čisto mladih letih. Meni ta maskara ni kaj ekstra všeč. Pač zame morajo biti trepalnice definirane in lepo razčesane. Jaz sem v eyeliner čisto zaljubljena, si pa želim, da bi bil vodoodporen, ker se mi zdi, da če se mi že malo zasolzijo oči, hitro izgine. Maskara pa ... ah, saj ne vem več, kaj naj si mislim o njej. Že prvi vtis slab, sem si rekla, da ji dam novo priložnost, pa me še vedno ne prepriča. Kot si rekla, ne definira trepalnic, meni se zdi volumen precej povprečen, prvih nekaj dni sem bila zaradi nje črna pod očmi ... Očitno tale preprosto ni zame. Meni dobro zdrži :) Ampak imam večinoma spodaj kremno senčilo + powder eyeshadow. Kot sem brala ima ta maskara zelo slabe ocene. Meni ni tako slaba, ker mi da lep volumen, ampak drugo mi ni pa nič všeč. Pri meni avtomatsko odpade, ker ni vodooporna. Thank you :) I haven't heard of Bell Cosmetics before, I tend to skip reviews of products that I can't get in Slovenia, so that why I probably missed it :) I might check it out. Katera maskara se ti zdi najboljša za tvoje trepalnice, da jih fajn priviha in drži njihovo obliko? Sem prebrala že veliko objav in sem malce zmedena... :) imam pa sama podobne težave s trepalnicami kot ti, zato me zanima. Če bi primerjala tole L'Orealovo maskaro in tisto od Physicians Formula (Instant Lash), bi rekla, da je od Physicians boljša? Vodoodporne so edine, ki držijo zavihane trepalnice. Pri navadnih mi takoj padejo dol. Zame top tri: Lancome Hypnose wp, Essence I Love Extremes wp in Maybelline the Sensational wp. Revlonova Ultra Volume wp je tudi kul :) Aja pa nobena maskara meni ne zaviha trepalnice, tudi zelo težko verjamem, da katera bi. Zaviham jih s kleščami, maskara jih pa samo drži zavihane. Ja, od Physicians Instant Lash je boljša, ampak veliko težja za uporabljat. Meni obe ne držita trepalnic zavihanih, zato ju ne nosim. Je pa Physicians Formula najljubša ob moje prijateljice.